Lake Oswego’s “Hot August Night” is set for Saturday, August 5 from 6:30 p.m. to 9:30 p.m. and has a few surprises in store for party-goers this year. After several years of repeat performances by The Beatniks, this year’s featured band is The Hit Machine, which Portland Radio Project bills as “one of Portland’s premier bands for getting the party started.” A sample playlist on their website includes “Brick House,” by the Commodores, “Celebrate Good Times” by Kool and the Gang, “Centerfold” by the J. Geils Band and “Rock Around the Clock Tonight” by Bill Haley and the Comets. So while the band may be changing, the vibe is not—the dance floor should be hopping. There will be two rows of 100′ dock on each side of the main dock as well as one buoy line this year to accommodate the ever-growing lineup of boaters who want to join in the fun. Should be room for about 125 boats. 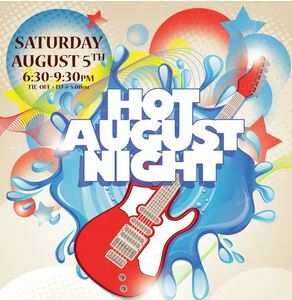 Here’s what else you need to know to get the most out of Lake Oswego’s Hot August Night. Buoy lines open at 5:00 p.m. at the entrance to Half Moon Bay at the east end of the main lake. Finger docks hook up to a central dock, allowing people to exit their boats, visit other boaters and hit the dance floor. Boaters are advised to bring an anchor and at least 20 feet of line to secure your boat if you’re not able to tie off on the buoy lines. Music starts at 6:30 p.m. on the stage at Pat and Pam Kearney’s home. A DJ will entertain you from 5:00 p.m. until then. BYOS (Bring Your Own Stuff). It can be a long night, so be sure you don’t leave home without being well stocked with food and drink to enjoy and share. BYOT (Bring your own transportation) There will be restrooms with extra dock sections enabling people to walk to them, but a paddle board, canoe or kayak will be necessary if you’re not tied to one of the buoy lines. Have a designated driver to ensure the safety of your guests as well as others. Want to get in on the fun? Give me a call and I can help you find a home in Lake Oswego so you can start living and enjoying the lake lifestyle. Reach me at 503.939.9801 or check my website. This entry was posted in Summer in Lake Oswego, Things to Do in Lake Oswego and tagged Hot August Night, Lake Oswego Oregon. Bookmark the permalink.